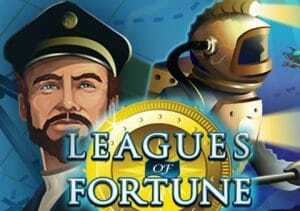 Head deep below the ocean waves for some Captain Nemo style submarine adventure in Leagues of Fortune, a 5 reel, 1,024 ways to win video slot powered by Microgaming. It comes with a free spins feature where all payouts are boosted by a 5x multiplier as well as an innovative gamble feature where you can decide how much you want to risk. Play from between 50p and £50 per spin. Leagues of Fortune is played using a 1,024 ways to win game engine – winning combinations are formed by landing the same symbol on adjacent reels rather than via traditional paylines. Those symbols have a salty feel. Joining the lower value playing cards are compass and chart, submarine, a harpoon-wielding diver and the bearded captain. The Leagues of Fortune logo is the wild – it replaces all other symbols apart from the scatter and can land fully stacked to fill entire reels in both the base game and free spins feature. To trigger the Free Spins feature, you’ll need to land 3, 4 or 5 of the treasure chest scatter. As well as a cash prize of 5, 10 or 75 times your total stake, you’ll also be awarded up to 36 free spins. The precise number will be decided by mysterious sea creature who’ll give you 5 free spins every time it flicks 1 of its mighty golden tentacles. Every payout during the free spins feature will be boosted by a 5x multiplier which can quickly get the cashier rocking. Leagues of Fortunes also comes with an unusual Gamble feature. In most gamble rounds, you just guess the colour of a playing card. Here you’re presented with a ship’s compass – shift the dial to choose your level of risk which can be anything up to 20 times your win. The needle then spins. If it lands in the blue segment, you’re a winner. Land in the red and you’re a loser. You can gamble all or half of your initial win using the gamble feature. We found the waters in this nautically themed game to be a little choppy with the variance in the medium to high range. The free spins feature represents the best opportunity to win big here. Get lucky with that bumper 5x multiplier and you could find treasure buried under the seas. If you like sea themed games, Novomatic’s Lord of the Ocean is recommended.